Reviving an old musclecar nameplate, the Chevrolet Camaro comes powered by a choice of V6 and V8 engines and features improved handling and great looks. Reviving an old musclecar nameplate, the Chevrolet Camaro enters the 2010 model year completely redesigned, finally with up-to-date technology. The new Camaro features modern V6 and V8 engines and handsome looks. Thanks to an independent rear suspension and optional Brembo brakes it even handles and stops well. 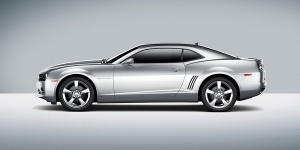 Find the used Chevrolet Camaro of your choice from a dealer in your area. Search our used car listings now.